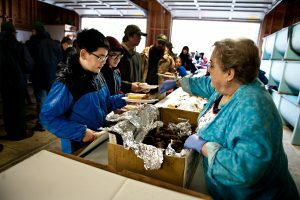 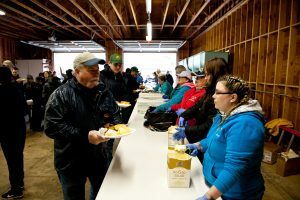 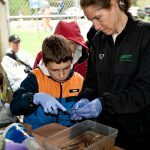 The volunteers descended on Whiskey Creek Volunteer Fish Hatchery on Saturday morning April 13th – lining Whiskey Creek Road, and filling the parking lot. 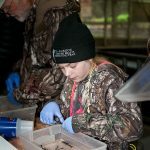 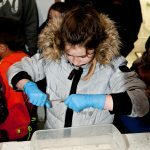 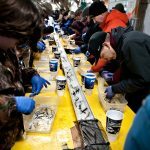 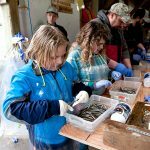 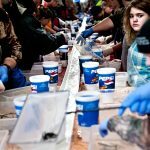 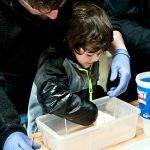 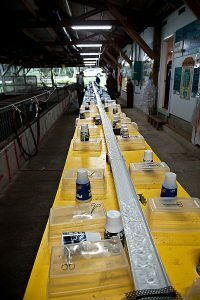 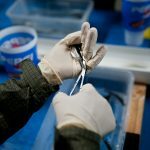 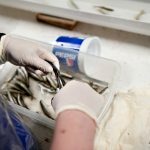 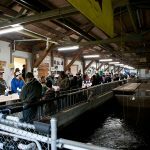 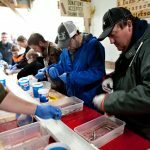 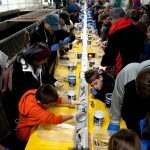 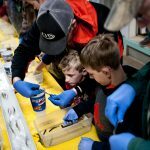 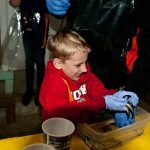 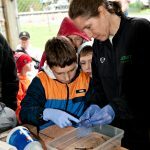 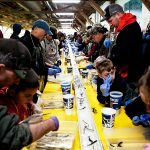 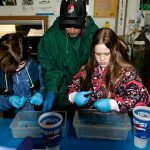 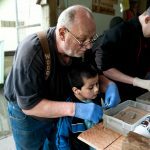 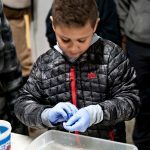 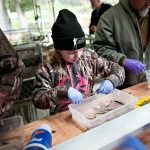 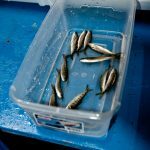 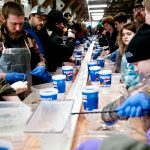 Greeted with doughnuts and coffee, over 300 volunteers made quick work of the 100,000 smolts, in less than three and a half hours, the smolts had their adipose fins clipped to identify them as hatchery fish. 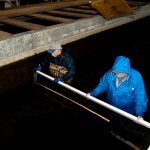 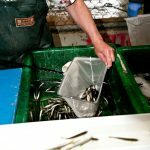 The fish will eventually be released in the Trask River, so future fishermen can catch, keep and enjoy one of nature’s finest fish — Chinook salmon. 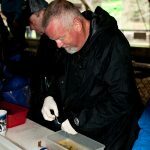 From Jerry Dove: “A lot folks that have been coming for years, so we had a skilled group. 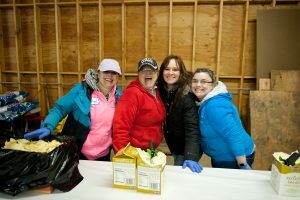 It is a well-oiled machine, thanks to all that helped, donated items and money. 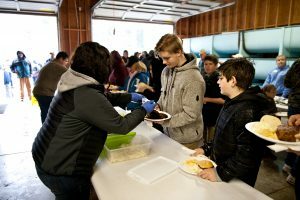 The mini garage sale, raffle, clothing sales and silent auction did very well. 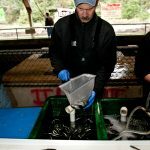 That is what keeps the hatchery going. 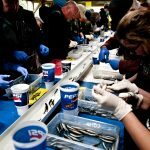 This has been a good 30+ years ride for me but is time to turn the gavel to someone younger.” Dove is passing the gavel to Tillamook Anglers VP Jim Young. 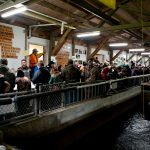 “Oh yeah, I’ll still be involved, but I’m confident that we’ve got a great group that will continue our success,” added Jerry. 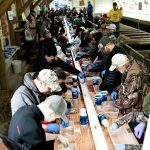 For more about Whiskey Creek Fish Hatchery or Tillamook Anglers programs, contact Jerry Dove at jdovetillanglers@gmail.com or 503-842-6519.